The beach is a fun place for not only you, but for your dog too! Walking and wading through the water, playing fetch with a piece of driftwood, laying in the sand – these are all things your dog will love during your week on Holden Beach. You don't have to leave you doggie behind! Our Bring Your Pooch program offers a variety of dog-friendly vacation rentals for you to choose from. The program includes one dog per property, weighing up to 30 pounds. Pending individual owner approval, another dog may be allowed with an additional $250 pet fee. Our apologies — we love Katie the Kitty, but she will need to stay and look after the homefront. 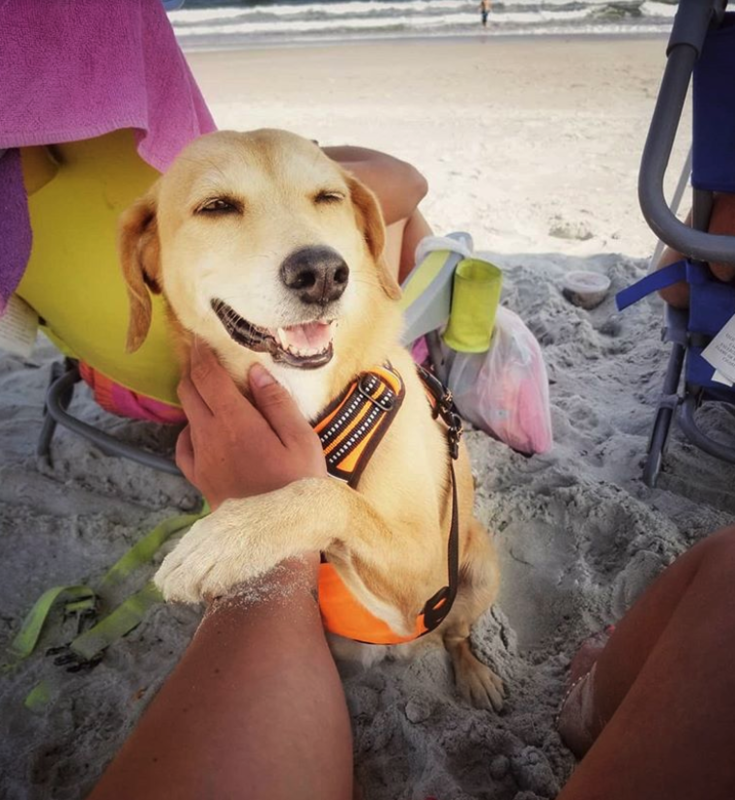 We put together some information on pet regulations, tips on visiting the beach, pet-friendly restaurants, and more to help both you and your dog have a fabulous Holden Beach vacation. Right here on Holden Beach, Mermaid’s Island Grill is happy to accommodate your dog at one of their many outdoor tables. There are also several restaurants throughout Brunswick County that will let your dog accompany you in their outdoor seating area. A few of these pet-friendly restaurants include Fishy Fishy in Southport, The Lazy Turtle in Oak Island, Inlet View in Shallotte, Calabash Seafood Hut in Calabash, Fibber McGees in Sunset Beach, and Pelican’s Perch in Ocean Isle Beach. Keep in mind that ownership and rules are subject to change, so you might call ahead to confirm. Dogs and their humans love visiting the Holden Beach Dog Park, which is located near the end of Scotch Bonnet Drive. Two fenced-in play areas are available for large and small breeds and allow your dog to enjoy some “off-leash” freedom. (The park is closed right now due to dredging in the area, but is set to re-open by Memorial Day Weekend 2019) Feel free to call the Holden Beach Town Halll (910) 842-6488 for more information. On Holden Beach, pets must be on a leash at all times. From May 20 to September 10, pets are allowed on the strand from 5 PM and 9 AM. Other rules for you and your dog pal are pretty standard and include: stay off the dunes and dune grass, clean up after your dog, and don't leave him/her unattended. Did you know that dogs can get sunburned? Identification — None of us love tan lines, but please make sure your dog is wearing their collar with ID tags, in case you and your dog are separated. You will also want to make sure your dog is current on all vaccinations and that you have access to the records if you need to visit our local vet. Overheating — Some dog breeds are more susceptible to overheating than others, but no matter what kind of dog you have, you will absolutely want to provide shade for them with a beach umbrella or chair while you are enjoying the sunshine. During a hot day, a two-hour visit to the beach is plenty long for a dog — remember, they aren’t able to sweat like us humans. Make sure you have plenty of fresh, cool water for your dog bowl. Keep an eye on your pet pal and visit a local veterinarian if you think your dog may be overheated. Sunburn — Yes, dogs can get sunburned! Breeds with short or light colored hair are most susceptible, but any dog can get sunburned if exposed to the sun for too long. You can find sunscreen specifically made for dogs at local pet stores – it is important that you do not apply regular sunscreen to your dog as zinc can be toxic if ingested. Apply to your dog’s ears, nose, inside of back legs and any other spots that receive direct sun. Just like you do for yourself, you will need to reapply after a swim. You can also put a fun Holden Beach t-shirt on your dog for protection. Ocean Swimming — Unless you know your dog can swim in the ocean, you may decide to have your dog wear a lifejacket. Be on the lookout for rip currents and waves pushing them under or tides pulling them out. First Aid — A few things that could hurt your dog at the beach are sharp shells, and jellyfish stings. If you or your pet are stung by a jellyfish, don't rush to try and pull out the stingers! First, douse the area in vinegar and then use tweezers to extract the stingers, not your bare fingers, ouch! Finally apply heat, not ice. Saltwater — Saltwater can irritate all of our skin, so a quick rinse after an ocean swim is important. Most of our rentals have boardwalk water hoses and/or outdoor showers. Who doesn't love a refreshing shower while communing with nature? Check out our large selection of beautiful dog-friendly vacation rentals, and feel free to call us anytime at (800) 655-3367 with any questions you may have. We hope to see you — and your dog — soon on beautiful Holden Beach! Darcy Geho is a contributing author to the Hobbs Realty blog. She spent 11 years working in the vacation rental industry while she lived on and traveled the North Carolina coast. Like most of our visitors, when Darcy isn’t at the beach she looks forward to her next visit. In her spare time, Darcy likes cooking and food preservation and enjoys sharing her adventures on her blog.